It's great having a PayPal payment integration built right into JotForm, but what if you want to give your customers other payment options such as paying by check? Let's start by building the form. 1. 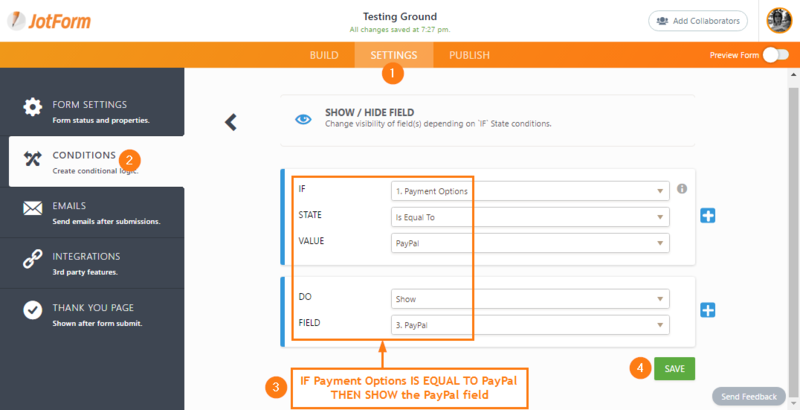 Use the Single Choice Field (radio button) to setup your payment options field. Then set this field as Required. To setup the Check option, just use a Text Field and place any relevant information on what the user needs to do to complete the payment. 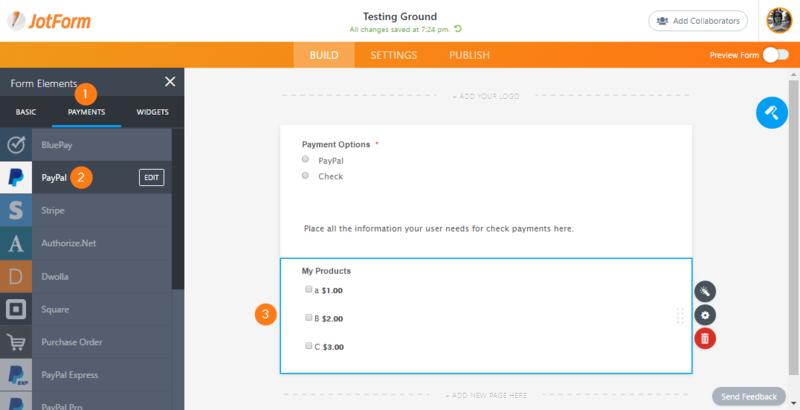 And for the PayPal option, you can use PayPal Pro or just PayPal (standard) from the Payment Fields. You can also add more payment options, not just check, for as long as it's an offline payment. Please be informed that you can only use 1 payment gateway per form. 🔘 When you select Check on the payment option field and submit the form, it will be submitted right away. 🔘 When you select PayPal on the payment option field and submit the form, it would redirect to PayPal's checkout page where you need to complete the payment. Another alternative option is to redirect users to a different form URL based on the selected payment method. For questions, please let us know below! Our church paypal account is set up to allow donors to make a credit card donation through paypal (the church account) without having a personal paypal account. There is an option for them to just enter their credit card number without logging into paypayl. How do I set that up on my form? I want people to be able to pay with a credit card without being forced to set up a personal paypal account. the refunds, I could use the money, but I don't get anywhere with your forms. I need help. I lost my old email address. I am stuck, can't get it. Excellent support - Kudos to the support team and to your manager. I am kind of - out of words. Shocked to receive such good service. Looks like - you guys are lving the concept mentioned in Art of Excellence book. How can I get the "Text Field" to show up in the customer's autoresponder email? There's no way they're going to all pay directly while they're sitting there filling in the form. I need to have the "Text Field" (which would contain the pricing, etc.) in the autoresponder they receive. I cannot put the pricing in the text of that email, as we charge a different amount via credit card and check, and that would just confuse everyone. There should be a way in the "Conditions" to tell it to show that field in the autoresponder, seems to me. Ok. So this is great BUT, in this same form (URL below), UNTIL someone clicks check/credit as a choice, all the other fields show up. I guess that's not the end of the world but I would rather those fields don't show at all UNTIL a selection is made. Is that possible?? I have the form set up and the payments are collected. I want to be able to pass on the PayPal fees to the customer. Is this a setting in jotform or PayPal? I also cannot get my "other payment options" to work. Everything gets redirected to paypal! Hope someone can help. I cannot get the fields to show?? My form includes multiple purchasing options, which requires the view of a final subtotal based on what is being purchased in order to see the total amount owed. How can people who are using my form but are paying by check or over the phone be able to see what their sub-total is for the amount they owe and still submit their form if not paying with a credit card? I understand the concept, but I am missing something, as mine too is also always advancing to paypal, irrespective of the solution. It is because I am using multiple items with Paypal, so the paypal choice has already been made? By me it doesn't work correctly. I I select 'by check' the field 'PayPal' is hide but I'm all the same redirected to the PayPal page. what if your payment option is a coupon code for 100% off. Do i add this as a payment option i.e. member coupon and in the payment add the coupon??? AWESOME! Extremely easy to follow instructions. You are a lifesaver. I independently have done as suggested too, and it used to work last week...and now it doesn't work any more - I'm very puzzled?? UROCK. This is awesome, thank you! I think this is great and love the way it made my form look so professional. I did what you said but for some reason my submit button has disappeared. It shows until i put it online and then it is gone. Can you please provide a working link to the sample form you mentioned above? 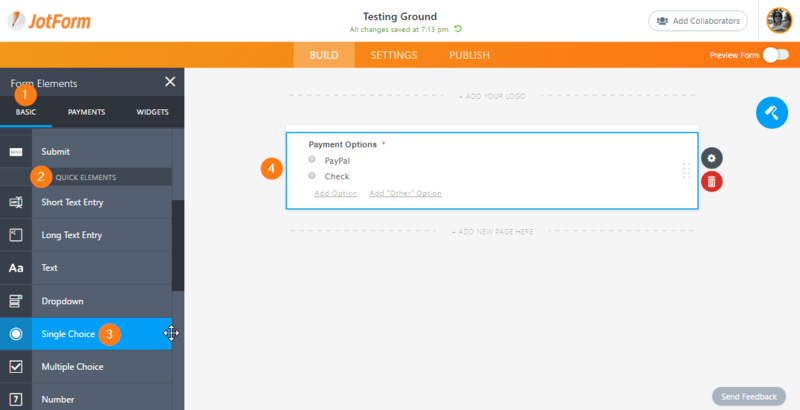 I'm not sure I understand the "why" of creating a dummy Free field with Paypal... can you explain? This was exactly what I needed, thanks! !